Shrublands Farm is a 300-acre arable farm, about 1 mile from the coast, 2 miles from Cromer and 20 miles north of Norwich. We offer our guests the choice of 2 twin rooms or 1 double (all with private or en suite facilities). Double and twin rooms can be let as single upon request. Rates range from Â£35 to Â£37 for single occupancy. Colour TV in all bedrooms. Full central heating. 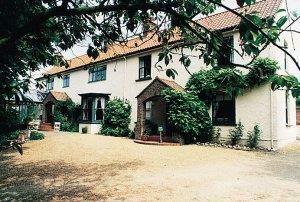 Ideally situated for exploring both coast and countryside. Open all the year except Christmas. English Tourism Council Silver Award. From A149 turn left or right (depending on approach direction) to Northrepps Village. Proceed 1 mile to centre of village 50yds past Foundry Arms pub on left. Go through Cromer town centre and out towards North Walsham on A149. After 2 miles turn left to Northrepps Village and proceed 1 mile to centre of village 50yds passed Foundry Arms pub on left.